Types of Fish, behaviors, anecdotes and FSI. FSI? The only way you and me can glide effortlessly is if we put on some roller blades! (Whether you end up falling over or crashing into a trash can is the real difference). There are just so many types of fish. Thousands of species in the world. Alas too many of them are either endangered or extinct already. Perhaps too many disappeared without us humans even knowing what they were. Luckily there are a lot of people (hint, you and me) who just love fish. So we got a dazzling array that ARE still around and hopefully will be so for a while more. This is basically a list of tropical fish I know well through some sort of experience. Either via keeping them as pets or catching them through rod and reel (I love fish, doesnt mean I wont catch em and eat em too - of course I dont eat the fish I have in my fish tanks!). 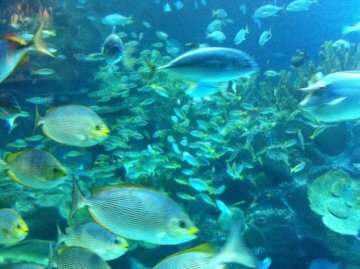 Many of these are types of freshwater fish specifically, some of these in turn happen to be aquarium freshwater fish while a couple may be tropical sea fish. because they were the things I wanted to know and now know! (Okay, I DID mean to make that as a tongue twister, try saying that about 10 times real fast :P). Let me begin with the king of fishes to me. A known vicious predator but contrary to what you may think, to me, this is a beautiful fish. The Snakehead fish. One of the favorite foods of the Snakehead fish, well at least in captivity, and incidentally is a major food for mankind as well (Dont tell me you havent tasted it? Where you been man?) is the Tilapia fish. A vast majority of tropical omnivorous fish are community tropical fish i.e. it is fine to keep these types of fish together with other species of community minded fish. The first group that would come to mind are the schooling river fishes that tend to be silver with some sort of visual differentiation such as shapes, lines and colors. These types of fish tend to swim at mid level of a fish tank and can be as big as a few fingers or up to the size of your arm or more. A second group are the bottom dwellers that tend to prefer nooks and crannies where they can hide most of the day. Among these bottom dwellers, the first that comes to my mind are the Synodontis fish. 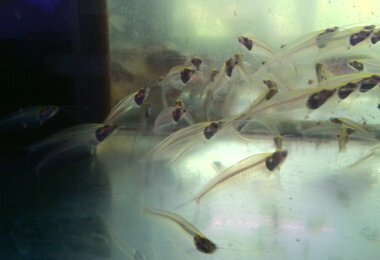 Now the cutest bottom dwellers, and these guys are not just cute but also tiny, are the Corydoras. Again, the bottom dwellers are types of fish that can vary from the pint sized Corydoras (some species are the length of your nail - and I kid you not) to very large fish indeed such as the Red Tailed Catfish of the Amazon that can be the size of your chest! Now all these fish are called omnivores for a good reason. They will eat pellets just as much as they would probably eat each other IF they are not of the same size. So an important point about community tropical fish is, you want to keep the ones of the same size together. So this means you dont want to mix Corydoras that are about two thirds the length of your little finger (at best) with river fish that are 3 or 4 times their size. Nor would you want to mix Neon Tetras or Harlequin Barbs (or Harlequin Rasboras), both one third the length of your little finger (and perhaps half of that one third in terms of width!) with a river fish that is ten times their size. You simply will not see the smaller fishes around, sooner or later! In fact, some species, even when the size is the same or almost the same, the other fishes may just make a meal of them or out compete them for food. This is true of the 7 striped barbs and Bala Sharks for e.g. Sooner or later, these 2 types of fish will disappear if mixed with others! So really a third group would be the little fish such as Harlequin Barbs and Neon Tetras that I mentioned. These guys can actually live in smaller tanks and are the main fish suited to live with Live Aquarium Plants. Any larger fish would either eat the plants or destroy them simply from swimming about. An example of a good tasting tropical marine fish is the Golden Snapper. Good Eats! and good fun reeling in! An alternative marine predator is the Red Snapper. You thought you liked shrimp? Well you havent met with the Sea Bass have you?